Maytag Commercial Coin Op Stacked (2 x 9kg) Programmable Electric Heat Dryers. Go to our Richard Jay website for more info here. The Maytag MLE24PD are two stacked commercial electric dryers, with 9kg capacity each. 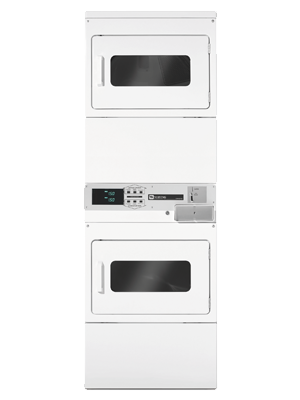 You can actually double your dryer income and help eliminate waiting with two dryer compartments in the same floor space as one single-load dryer.